MCLEAN, Va.--(BUSINESS WIRE)--Despite living in a digital age, business professionals still prefer face-to-face meetings. According to a recent global study by Hilton Worldwide (NYSE:HLT), more than two-thirds of surveyed professionals, ranging from millennials to age 65+, overwhelmingly prefer meeting in-person over any other collaboration method. The study, which polled business professionals across the U.S., UK and China, uncovered the value of face-to-face interactions and specifically the role of coffee and tea in productive meetings. To encourage connections and ignite powerful ideas over coffee, Hilton launched a global coffee promotion, providing complimentary coffee or tea for the first meeting break at participating Hilton properties. Meetings booked now though November 15, which take place before March 31, 2016, are eligible for the offer. Hilton Worldwide (NYSE:HLT) is a leading global hospitality company, spanning the lodging sector from luxury and full-service hotels and resorts to extended-stay suites and focused-service hotels. For 96 years, Hilton Worldwide has been dedicated to continuing its tradition of providing exceptional guest experiences. The company's portfolio of twelve world-class global brands is comprised of more than 4,440 managed, franchised, owned and leased hotels and timeshare properties, with more than 730,000 rooms in 97 countries and territories, including Hilton Hotels & Resorts, Waldorf Astoria Hotels & Resorts, Conrad Hotels & Resorts, Canopy by Hilton, Curio – A Collection by Hilton, DoubleTree by Hilton, Embassy Suites by Hilton, Hilton Garden Inn, Hampton by Hilton, Homewood Suites by Hilton, Home2 Suites by Hilton and Hilton Grand Vacations. The company also manages an award-winning customer loyalty program, Hilton HHonors®. Hilton HHonors members who book directly through preferred Hilton channels have access to benefits including free standard Wi-Fi, as well as digital amenities that are available exclusively through the industry-leading Hilton HHonors app, where HHonors members can check-in, choose their room, and access their room using a Digital Key. Visit news.hiltonworldwide.com for more information and connect with Hilton Worldwide at facebook.com/hiltonworldwide, twitter.com/hiltonworldwide, youtube.com/hiltonworldwide, flickr.com/hiltonworldwide and linkedin.com/company/hilton-worldwide. 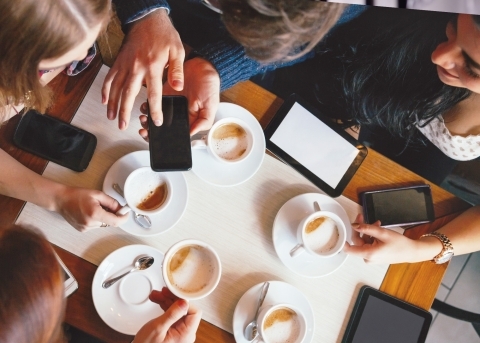 Despite living in a digital age, business professionals still prefer face-to-face meetings with coffee and tea at the center found a recent global study by Hilton Worldwide.